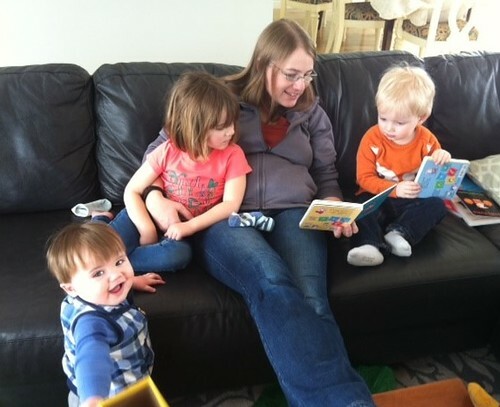 Here’s daughter Seabrooke, reading with one-year-old son Rowan, three-year-old daughter Coralie, and two-year-old nephew Everett. Books have always been important in our family. Now there is a new generation of readers in the making. Seabrooke went on to become an author! 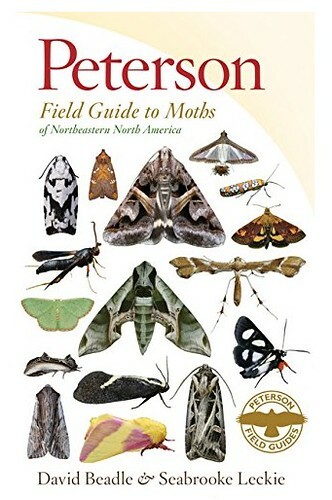 Her Peterson Field Guide to Moths of Northeastern North America was published a few years ago, and a new guide, Peterson Field Guide to Moths of Southeastern North America is set to be released through Amazon on March 13th! 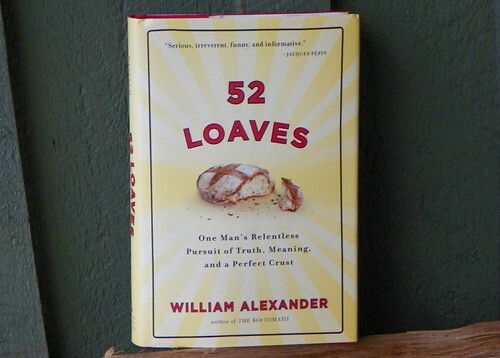 52 Loaves by William Alexander. Algonquin Books of Chapel Hill, 2010. A few years ago, I took a notion that I would like to work on breadmaking skills. Once the weather turns cold the appeal of the fireside is undeniable and a loaf of bread baking in the oven, filling the house with that warm, fresh-baked aroma, certainly helps to complete the ideal. There is a certain mystique around breadmaking, but the process is actually quite simple, at least for a basic loaf. I wrote about baking bread on a snowy pre-spring day back in March. You will find that post here. A year or two ago, when I expressed an interest in breadmaking, my sister gifted me Bill Alexander’s book, 52 Loaves, for Christmas. Like many readers, I have a shelf full of books awaiting me. After joining the queue for an extended period, 52 Loaves finally made it to the top of my reading list. With another winter at hand, I enjoyed this foray into Alexander’s experiences with bread. The book’s title, 52 Loaves, suggests to me that Alexander experiments with a different bread every week for a year. That’s not the case. 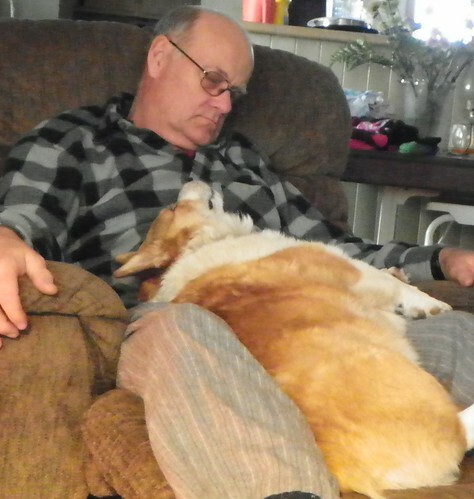 Rather, Bill sets baking the perfect loaf of one particular type of bread as his goal and sets out to achieve this perfect loaf by experimenting with the baking process over a year of weekly sessions. The loaf in question is peasant bread, or Pain de Campagne, which uses just four basic ingredients: flour, yeast, salt and water. Alexander’s search for perfection leads him in many directions across the year. He experiments with growing his own wheat and processing it into flour. He visits a yeast production factory in Montreal. He builds his own backyard oven. He experiments with the baker’s percentage. He develops his own levain, or sourdough starter. He takes a baking course in Paris at the famous Ritz Hotel. He visits a traditional market and communal baking oven in Tunisia. And finally, he shares the art of breadmaking with monks in France! Alexander is a convivial and informative guide to the many aspects of breadmaking. His book is at once an entertaining read and a source of interesting facts and data about the staff of life, bread. Quite highly recommended for anyone who has ever enjoyed a loaf of bread. 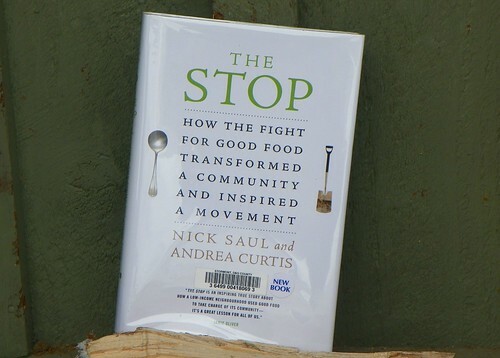 The Stop: How the fight for good food transformed a community and inspired a movement by Nick Saul and Andrea Curtis. Random House Canada 2013. When Nick Saul was hired in 1998 as the new executive director of The Stop, a food bank in Toronto’s low-income neighbourhood of Davenport West, the organization was in trouble. He settled into a tiny office in the cramped, run-down space alloted to The Stop on the ground-floor of the Symington Place public housing building. A single staffer and a handful of dedicated but tired volunteers were barely keeping The Stop afloat. A decade later, in 2009, the transformed Stop opened a satellite location called the Green Barn. It was visited by celebrity chef Jamie Oliver, who declared The Stop to be “Toronto’s food mecca”. This success story didn’t happen overnight, and in The Stop, Saul relates the sometimes rocky road that led from his early days at a struggling food bank to a new community food model. Food banks are a relatively recent phenomenon. They were originally developed in Arizona in the 1980s. Food Banks were designed to be a temporary measure to help people during a 1980s economic recession. But they have become a permanent fixture in communities all across North America. The first official food bank in Canada was opened in Edmonton in 1981, where incoming people looking for work in the oil fields were sometimes left unemployed and hungry. In Ontario, hunger took an upswing with the Mike Harris government’s “Common Sense Revolution” (1995-2002), which, with a lot of rhetoric about lazy poor people, set about slashing and burning the social welfare system, chopping welfare rates by 21.6 percern and cancelling new affordable housing projects. The Davenport neighbourhood, long an area settled by new immigrants, was once known for its factories, including General Electric, American Standard and a baked goods plant. But as the factories shut down, many people in the area struggled to find stable employment. With most of the factory jobs gone, the jobs that remain are often poorly paid service sector positions. Residents, already struggling, were hard-hit by the government’s common sense. Food banks can never be more than a stop-gap measure. Saul began moving The Stop away from the old charitable model to one that sought to bring dignity and support to needy area residents through an integrated systems approach. A first step began in that spring of 1998, when a local parks supervisor proposed using an overgrown bocce court in a local park for a vegetable plot. That fall, the food bank was enriched by a truckload of fresh garden produce. The garden didn’t just produce food. It inspired community interest and the participation of local citizens. Gradually, The Stop became a centre for programs that helped expectant and new moms make healthy food choices, brought people together over shared meals, taught singles how to prepare nutritional food, and introduced children to the fun of cooking. At The Stop, people can find help with dealing with government bureaucracies or other issues. 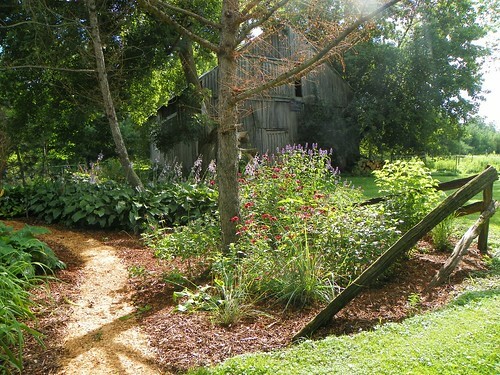 In another innovative, mutually helpful program, The Stop forged bonds with The New Farm, a family-run organic acreage near Creemore, Ontario. The Stop is now The New Farm’s single biggest customer, supporting local, sustainable food production while providing top-quality food to the centre. You can get a better idea of the vitality of The Stop by visiting the website: http://www.thestop.org/ As The Stop has grown, so has its budget. In 1998, the budget was $250,000. Today it is around $4.5 million, no small enterprise. IN 2011, The Stop model expanded to two new locations. The first of two pilot projects was launched in Perth, Ontario, where it is named The Table Community Food Centre, linked here. A second was started in Stratford, Ontario. Both are very different communities than Davenport West, and face different challenges, such as providing food programming for seniors and serving a wider rural community. After nearly fifteen years at The Stop, Nick Saul has moved on to developing Community Food Centres on a national scale. In 2014, Community Food Centres Canada, linked here, plans to open new centres in Winnipeg and Dartmouth, NS and another in Toronto. In this book, Saul not only tells the story of The Stop, but provides plenty of food for thought on food issues and poverty. His story is enlivened by the introduction of some of the many people his work has brought him in contact with at The Stop, and he takes us with him as he travels to Brazil for conferences, farm fundraisers, TTC barns and much more. For anyone with an interest in community and the future of food, The Stop is a great read. To that shore that is blessed of God. 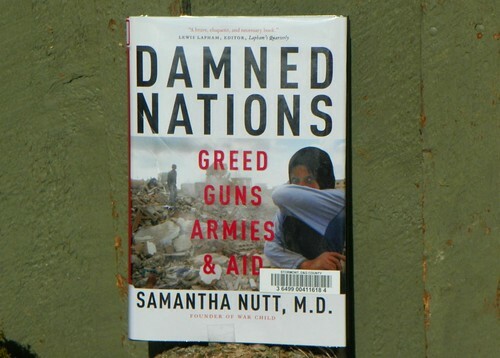 Damned Nations: Greed, Guns, Armies & Aid by Samantha Nutt, M.D. McClelland & Stewart 2011. First posted at Willow Books on March 21, 2012. I often see bumper stickers on cars that read “Support Our Troops!” or “If you don’t stand behind our troops, feel free to stand in front of them.” Huh? Catchy, but what the heck is that supposed to mean? I don’t know of anyone who doesn’t “Support Our Troops”. But supporting a war is quite another matter. For nearly 20 years, Dr. Samantha Nutt has worked in many of the world’s most violent hotspots, from Iraq and Somalia to the Congo (DRC). In Damned Nations she shares some of her experiences with readers and shines a light on circumstances that are almost impossible for the average viewer of the evening news to grasp. In America, those who questioned the war in Iraq were branded Saddam Hussein sympathizers. If you’re not with us, you’re against us! But what are the costs of these wars? What is it like to be a civilian in a combat zone? Who are the casualties of war? In World War I, just 15% of the casualties were civilians. Now, 80% of casualties in wars are civilians. In the Shock and Awe campaign, 7,500 Iraqis died and almost 18,000 were injured. War is big business. Annual world-wide military spending now exceeds $1.5 trillion dollars. That’s $225 for every person on the planet and the most rapidly expanding market for weapons is the developing world. The market price for an assault rifle in a war-torn country averages less than the cost of admission to an American theme park. We became accustomed to thinking of Canada’s role in the world to be that of peacekeepers, but in fact, Canada is among the world’s top 10 arms exporters, with one of the lowest international Arms Transparency ratings among industrialized economies. Who profits from these arms sales? Well, Canada’s teachers are among the beneficiaries. All but two provincial teachers’ pension funds are invested in one or more of the world’s top one hundred arms producers, while the Canada Pension Plan holds more than $200 million in investments in top arms-producing companies. Instability in regions such as eastern Congo often benefits arms dealers, mining companies, smugglers, foreign governments and other profiteers. The DRC is blessed and cursed with deposits of gold, diamonds, tin, copper and coltan (needed for electronic equipment such as cell phones). When Congo gained independence from Belgium in 1960, its first democratically elected prime minister was deposed in a CIA-sponsored coup just 3 months later, allowing corrupt dictator Mobutu to take charge and amass a personal fortune while leaving the country in chaos. All of the money that is currently poured into military operations could go a long way towards solving some of the problems at the root of unrest were it redirected. Nutt notes that in countries such as Afghanistan, extremist movements offer angry young men, with no hope for their future, money and a sense of belonging. The only way to abort such movements – to strip them of their platform and subsequently their foot soldiers – is to strangle them with arms-control measures and thwart them through youth education, skills training and employment. And a justice system is vital to end the culture of impunity enjoyed by war’s profiteers. Nutt looks at many aspects of the aid scene in war-torn and disaster-struck regions and dissects some of the proposed solutions. She also offers recommendations for where you might best spend your charitable dollars. Disasters such as the Haiti earthquake often prompt well-meaning outpourings of dollars that can’t all be wisely invested in a short period, while long-standing war zones attract little support. Entertainment personalities who establish their own charities can raise funds, but they don’t have experience as aid providers. Donations of goods such as clothing are also problematic because they can undermine the local industries vital to a thriving economy. Look for organizations with a long-term commitment and experience in a region. Consider a small but regular contribution to an ongoing project instead of a one-time donation to a disaster fund. Projects that empower women help a whole community. And don’t send a goat, send a lawyer! Nutt co-founded War Child in 1999. War Child’s mission is to empower children and young people to flourish within their communities and overcome the challenges of living with, and recovering from, conflict. You can link to the War Child website here. Although Damned Nations offers a great deal of information, the narrative never bogs down in facts and figures as Dr. Nutt enlivens her discussion with anecdotes from her often nerve-wracking encounters in war-torn regions. Damned Nations is a powerful and thought-provoking book. 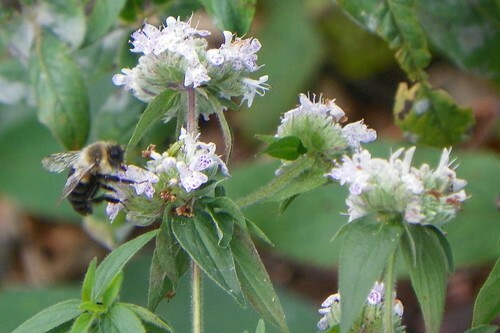 I have many plants in my garden that are very popular with bees and other pollinators. Pictured above is a favorite, the perennial Lemon Queen Sunflower (Helianthus ‘Lemon Queen’), which blooms profusely in late summer. I reserved one corner of the garden for a few plants that can be a bit unruly, but are beloved by pollinators. I call it Bee Corner. 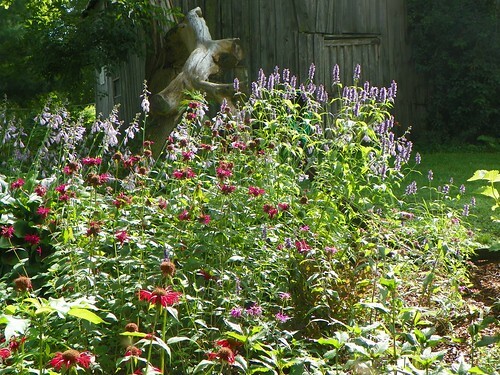 There are an assortment of monarda varieties. Monardas can be a bit rambling, and it is welcome to spread out at will here. 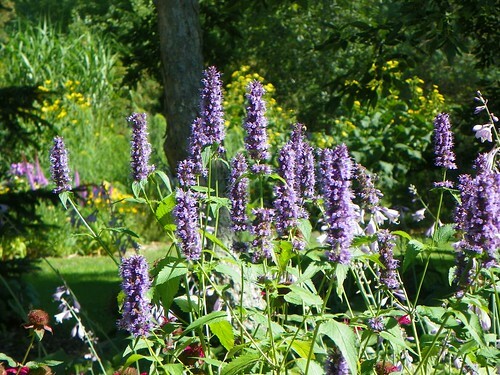 There’s also some agastache ‘Black Adder’, which did very well this summer. 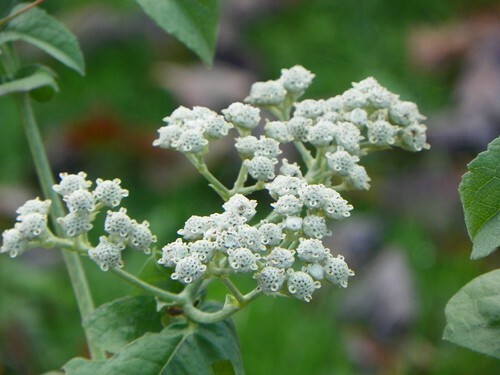 New to the corner are wild quinine (Parthenium integrifolium) and hairy mountain mint (Pycnanthemum pilosum). 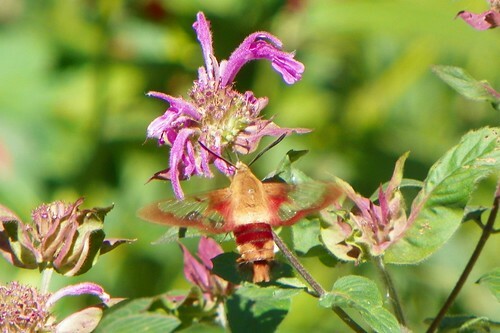 They’re both North American natives that attract pollinators and have settled in well. Next year, they can take engage in a turf war with the monardas. All comers can feast without fear of poisoning. I never use pesticides of any kind on my plants. The plants are all strictly on their own, thrive or die, and mostly, they thrive. Lately, Colony Collapse Disorder has been in the news, and the rise in the use of neonicotinoid pesticides and fungicides is suspected as a contributing cause. The jury is still out on the exact causes of honey bee die-offs and because of their economic importance, honey bees are getting a lot of attention. One thing is for certain though. 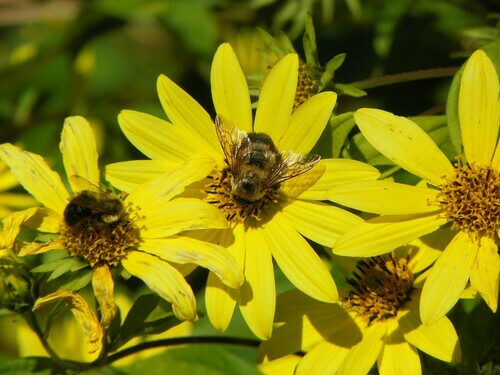 It’s not just honey bees that are affected by rampant pesticide use. We are as hooked on pesticides today as we were in the 1960s, when, in her seminal book Silent Spring, Rachel Carson warned us of the rain of poison that was bringing death to our waters and killing thousands of birds…. In many ways, birds are in greater danger today than in the 1950s because modern pesticides are more lethal. Older OC pesticides (organochlorines, fat soluble pesticides that can be stored in the fatty tissues of animals) were replaced in the 1970s and 1980s by “safer” pesticides like organophosphates and carbamates. These pesticides are safer because they break down within a few days and are not stored in the body, and so do not accumulate in the food chain. But many, like monocrotophos, are vastly more toxic to birds (and people) than were the OC pesticides. Modern insecticides are designed to kill their target swiftly and then break down before “non-target” animals come into contact with the poison. This is easier said than done. Birds can be exposed to these insecticides via direct contact with sprayed plants, by eating insects and fruits in areas that have been recently sprayed, or by eating pesticides that are applied to the ground in the form of granules….We have traded persistence for toxicity. Many insecticides are lethal to birds because they are neurotoxins and interfere with the nerve impulses inside the bodies of animals. They disrupt the signal that must jump from neuron to neuron via chemical messengers, causing severe shaking, then paralysis and asphyxiation. Pesticides that are effective in killing insects are also very toxic to birds and other animals, including humans. You can help reduce the use of agricultural pesticides by buying organic foods. You may feel that buying organic items such as bananas is not worthwhile because you peel the bananas anyway. But by buying organic bananas you support the reduction of the pesticide burden where the bananas were grown. You can also step more lightly on the land by buying other earth-friendly products such as shade-grown coffee. For more on threats to birds and ways you can make a difference, Silence of the Songbirds is a great read. 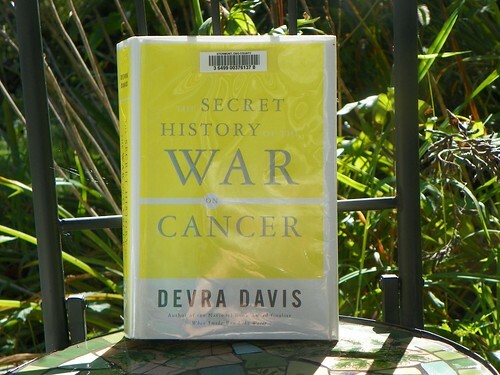 The Secret History of the War on Cancer by Devra Davis. Basic Books 2007. NOTE: Exerpt from Wikipedia. The ‘War on Cancer’ began with the National Cancer Act of 1971, a United States federal law. The act was intended “to amend the Public Health Service Act so as to strengthen the National Cancer Institute in order to more effectively carry out the national effort against cancer”. It was signed into law by then U.S. President Richard Nixon on December 23, 1971. For more than a century, the pollution of our air and water has been routine, business as usual. As outlined in The Polluters, reviewed here, the mantra of big business has been “Spill, Study and Stall”. Governments on every level have enabled the poisoning of our land, turning a blind eye to infractions and failing to protect citizens from even the worst abuses of polluters. Additionally, we live in a veritable sea of synthetic estrogens and other hormones and are routinely exposed to materials that never previously existed, with more than 80,000 chemicals in widespread use. Fewer than 1,000 have been tested for toxicity and how these chemicals interact is an open question. There are prices to be paid for the convenience of unbridled polluting and the underregulation and inadequate testing of new potential toxins. One price is cancer. Countless people pay for pollution of underregulated workplaces and poisoned air and water with their lives. The connection between our environment and cancer has long been recognised. At a 1936 International Congress of cancer researchers, reports showed that many widely used agents were known to be cancerous for humans, including ultraviolet and x-ray radiation, arsenic, benzene, asbestos, synthetic dyes and hormones. Researchers reported that excessive sunbathing could lead to skin cancer and that exposure to estrogen could produce breast tumors. Yet just as there has been a widespread failure to limit pollution, curbing the known causes of cancer has also been slow. Although researchers reported in 1936 that excessive sunbathing could lead to skin cancer and that exposure to estrogen could produce breast tumors, the National Toxicology Program of the U.S. government did not formally list both estrogen and ultraviolet light as definite causes of human cancer until 2002! Since World War II, information on the cancer hazards of the workplace and the environment has typically been discredited, dismissed, or disparaged. The tobacco companies’ long campaign to obscure findings on the dangers of cigarettes was successful for decades and served as a model for other industries to follow in a combination of deceptive advertising, sophisticated scientific spin and strongarm politics. Scientists who speak out have often been targets for funding cuts and career derailment. A revolving-door policy has often seen regulators and cancer researchers move in and out of cancer-causing industries. Some early leaders of the American Cancer Society, for example, left to work for the tobacco industry. Distinguished researcher Sir Richard Doll discredited the findings of other scientists without revealing that he was on the payroll of the chemical industry for years. The life-saving test for cervical cancer, the Pap smear, was not put into widespread use for more than a decade because of fears that it would undermine the private practice of medicine. To this day, the Cancer Society speaks little about reining in the causes of cancer, or at best, concentrates on personal lifestyle choices rather than broader exposures to toxins. It’s all about the cure! Run for cure! Donate for the cure! Wear a pink ribbon for the cure! When quite obviously, it would be better not to get cancer in the first place. Secret History is by no means a light read, but it is often eye-opening and interesting.